With hope, Ron Howard’s new documentary, which serves up a greater inside look into the worldwide sensation The Beatles at their live performance peak than has ever been explored before, will help dispel the idiotic notion that the Fab Four sucked live. Anyone who’s ever given the two volumes of The Beatles Live at the BBC, or the newly remastered release of Live at the Hollywood Bowl (released on CD for the first time last week), or many of the band’s bootlegs (this guy makes a great case for their 1963 Swedish Radio Show being one of the best performances by anyone) a good listen should know that the idea is bogus, but for those who believe the oft told tales that the teenage girls screamed so loud that the Beatles didn’t even try to play their instruments or sing at their best, this doc is essential viewing that should right that wrong. 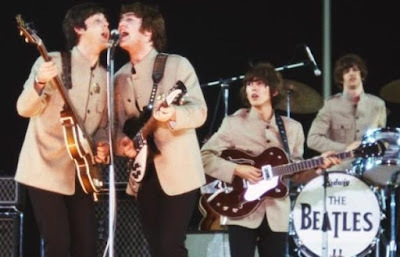 From the opening footage of the quartet at Manchester's ABC Cinema in 1963 (among the earliest color films of the group) to their historical TV debut on The Ed Sullivan Show in 1964 to their equally historic Shea Stadium show (the first rock concert ever staged in a stadium) in 1965 to their final concert at Candlestick Park in San Francisco in 1966 we see the Beatles play and sing their asses off despite the roaring audience. I won’t trust anyone who watches this material, much of it never officially released before now, and says that they were a bad band live. Howard, who despite his big league movie directing career will always be Opie Cunningham * to me, and editor Paul Crowder (no stranger to rock docs as he co-directed and edited “Amazing Journey: The Story of The Who”) supplement the wealth of rare footage with new interview segments with surviving Beatles Paul McCartney and Ringo Starr, along with archival interview clips of John Lennon and George Harrison. There are also tasty testimonials from the likes of Sigourney Weaver (love the clip of her as a teenager being just another emotional, screaming fan at one of their shows), Whoopi Goldberg (her mother took her to the Shea Stadium show), Elvis Costello, Eddie Izzard, and broadcast journalist Larry Kane, who accompanied the Beatles on every date of their first two US tours. Although I understand that he doesn’t fit into the “four guys against the world” narrative, it doesn’t seem right that original drummer Pete Best isn’t mentioned at all. The Beatles’ early years are glossed over pretty quickly to get to when they broke big – I get that – but Best deserves at least a quick shout out. There are some other subjects that are perhaps too tidied up as well, like the bit about Lennon’s famous quote about the Beatles being bigger than Jesus that led to album burnings and threats from the KKK, and it would’ve been nice to note the time that Ringo was replaced for a leg of their 1964 tour by a temporarily lucky bloke named Jimmy Nichol, but if Howard included every great anecdote, clip, or song from the band’s touring years it would be a mini-series half a day long. Credit must be given to how much history Howard crams into this project; the Beatles’ own big screen offerings during the period, A HARD DAY’S NIGHT and HELP (cash-ins on Beatlemania that became classics in their own right) are even covered properly. As a big Beatles fan since birth (it at least feels that way), I adored EIGHT DAYS A WEEK, and know that the bulk of Fab Four fans will completely groove on it too. I can’t speak for the non fans, but I bet they wouldn’t have read this far. The film, which premiered last evening in my area at the Rialto Theater in Raleigh, and is now showing at many indie theaters across the country (it also premieres on Hulu on Saturday, September 17th), is augmented by a 30 minute bonus film of the complete Beatles “Live at Shea Stadium” concert. It looks and sounds great owing to its 4K restoration, and it wonderfully keeps the joyous Beatles live vibe going if the one hour and forty minutes of Howard’s doc isn’t enough for you. As one could easily deduce from this review, EIGHT DAYS A WEEK only scratched the surface for me, but I’ll take it as it’s undeniably a powerful primer. * For those who don’t get it, Opie comes from Opie Taylor, Howard's role as a kid on ‘60s sitcom The Andy Griffith Show (where he was when Beatlemania went down), and Cunningham is from Richie Cunningham, his role on the ‘70s sitcom Happy Days (which took place in the ‘50s). Sigh, wish I didn't feel like I had to explain these things.